Three wooden crosses erected at the Somme in memory of County Durham soldiers have been reunited. In 1916 the memorials were placed on the Butte de Warlencourt, an ancient burial mound which overlooks the World War I battlefield in France. Ten years later they were sent to England and given to three County Durham churches. Now they have been brought together at Durham Light Infantry Museum and Durham Art Gallery for a special exhibition. Called The Somme Remembered, it marks the 90th anniversary of the battle. 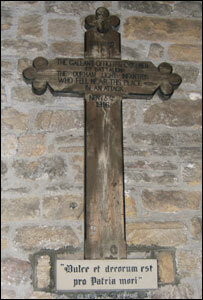 The crosses were erected in memory of Durham Light Infantry (DLI) soldiers who died in a failed attack on the hill. In 1926 the crosses went to St. Andrew's Church in Bishop Auckland, Chester-le-Street Parish Church and the Regimental Chapel at Durham Cathedral. The exhibition, which includes trench maps, sketches and original letters, runs until Sunday 16 July.